Introduction of the topic and my personal involvement with the topic. ?1 why is health important? 2 Why is there a worldwide rising interest in daojiao? 3 What is daojiao about? -?the teachings of dao is about how dao teaches about itself through its manifestations or absence of manifestations. In the famous yijing it is stated that if one resists dao the outcome will be known in a short time in the form of disaster. 4 What is the difference between daojiao and daojia? Daojia is the family of followers of dao. Their commitment to do so might remain vague or specific. Mostly their learning is individual, intellectual, feelings-based and so on. Many Confucians entertained the idea of following dao to complement the harsh practice of the Ru in a society as fully regulated as can. Western scientist and popular writers long time considered that daojiao was an aberration and that daojia was the actual Daoism. This theory is still mainstream, and is also sometimes propagated by Chinese writers that I’ve met. History caused the opportunity to think like that for a very long time because both in the west and east strong anti-religious movements took control of politics and education. All over the world people are now more lenient towards religion and thus many religions shoot new roots, partly by means of reinventing themselves with additions from science and other religions. In a way we can say that modern daojiao therefore embraces certain elements of daojia. Daojiao is in effect the merging of ru statehood with huanglao daoist thought. A lot of the life of people bonded with dao in religiousness spend much of that life doing service to kueishen, shangdi, huangdi and yudi as well as to sanqing, the three clarities, which are the three founding forces on which reality is build according to daojiao theory. Eventually the mythical Laozi became deified as well in the god Laojun. Other gods who became prominent were directional gods, of whom Xuanwu, later renamed as Zhenwu in Wudang shan became most famous. Xuanwu is seen as the son of Yudi and will eventually replace yudi as head of the heavenly bureaucracy. Further there is Xiwangmu, a former goddess of the afterworld, who gave birth to many gods and goddesses and who guards immortality and health. There is also tasiji, the deified first principle of things that is also a god of compassion. Next to the gods there are scores of immortals, people who have attained a divine state of existence and live on as cultural hero’s or as actual immortals supporting life from behind the scenes. Famous are Lu Dongbin and the eight immortals and Zang Sanfeng, who is immortalized in wudang culture specifically as the inventor of Taiji Gongfu and the struggle to make the emperor serve the people in the form of letting them get involved in the study of Dao and Yangsheng health practices. -Second stage we call true daojiao and starts in the Han dynasty where Zang Daoling organizes a heavenly bureaucracy in emulation of the Han state bureaucracy. His grandson helps organizing the Zhengyi movement also known as Tianshi pai or heavenly masters religion. Their idea was that through divine legal practice people could be given salvation from suffering. The religion was based on small communities but was also successful in the cities. Practitioners were living normal lives and had families. The zhengy pai still exists and is china’s oldest formal religion. An important part of the religion is its belief in immortals and gods that either help or bother mankind. Later under the influence of Buddhism, Quanzhen pai came into being which incorporated many aspects of Buddhist monk life and other austerities. Abstention from meat and marriage became common. People lived in hermitages in the mountains far from city life’s temptations. masters such as Wang Chongyang came into the lime light, but especially so their way of teaching which was rather harsh. - Nowadays we see the third stage of daojiao which we can call Restoration Stage. It is also a time for daojiao’s exodus which makes it possible for people like me to learn about dajiao, live a daoist life and teach about it. Daosim is quite self-oriented and tight on maintaining its internal structure and cultural identity. Being a foreigner not everything is accessible, such as legitimately calling yourself a daoist because that requires state administration. Health science is the applied science dealing with health, and it includes many sub disciplines. -?exercise bionomics which discusses how the individual can manage body, emotions, mind, behavior and so on as to support the process of self empowerment of the individual which will lead to health. Health Science within Chinese culture is called yangsheng 养生, the cultivation of life. The concept of Sheng is akin to the agricultural process of growing food, and denotes the slowness of the process of all major transformations. It stands in contrast with the concept of the character Yang2杨 ‘to raise’ which is based on the idea of raising lifestock. The word Yang3养 refers to agriculture too, but it is the active component of providing: ‘making sure cultivation happens’. Sometimes it is translated as health or life cultivation, but in essence this translation is only partly correct, even though at the International oriental College we use this wording also frequently because in many cases the meanings are partnered significantly enough to do so. - Practice yangheng by means of constant presence of awareness of all ones actions and movements both awake and asleep thus a person can conserve jing, qi and shen. The idea of Yangsheng is that the span of life that one has is not predestined by nature. The length of life depends only on the care one gives to oneself and one’s fellow beings. In that sense we see that traditional health study concentrates on how to be a good human being. The first note for this we find in the Huangdi Neijing, a seminal classic of Chinese medicine, a founding? theory if you will. It starts with describing how people of olden times were able to live almost forever just by means of following and emulating heaven and earth and staying in touch with the processes inside themselves as well as the processes outside themselves, observing similarities and patterns which can be used like farmers use them, to choose what time is best to perform what action as to gain what result. The idea of being so much in control of the length of ones life stands in stark contrast with the determinist theories of modern biology and genetics in specific. On the other hand it harmonizes perfectly with the United Nations charter on Human Rights that every person should be able to live a life in control of his or her own destiny. As such the Chinese health science or Yangsheng has not lost any value for modern beings, and therefore alone it deserves the right to be studied in its own set of meanings and ideas, and not necessarily through the looking glass of western science prejudices about what reality is or should be. From the practices above, two practices specifically need to be explained. The first is the morally acceptable job. What is that? This points specifically to jobs that do support life or work against it. A car manufacturer is for instance debatable. However practical a car is, the way a car is made or how a car will perform its morally acceptable task might be is cause for concern. Laozi suggested that good can be found in evil and evil can be found in good, so balancing the quality of what one does as a task to sustains one’s life is not always easy. The fact that one introspects and investigates where one stands in these matters is what makes the process valuable. The second is practicing the body. Daoism as a whole does not believe in medicines. It doesn’t say medicines are bad, but it says medicines cannot cure anything. Although herbal or chemical medicines are good for business, Daoist medicine suggests that all things we ingest are potentially poisonous and therefore do harm the body if they get the chance. We should therefore never rely on medicines, except in very serious clinical cases, where the benefits seriously outweigh the risks. Acupuncture and massage on the other hand are more acceptable, because they leave more responsibility for the health and disease processes to the person affected by disease. 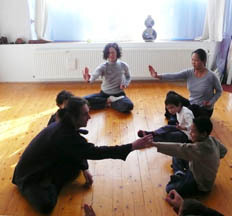 Qigong, neigong, tuna, daoyin and so on are all descriptive terms for approaches inside practice. In particular situations one might need a particular method to solve a problem. So although it is good to study one, such as Daoyin (Chinese style Yoga) it is better to gradually develop oneself in a variety of methods sufficiently fitting to each other in a system as to make them effective. Just mindlessly practicing can be as risky for one’s health as ingesting ginseng every day. After all we also do not every day throw tons of fertilizer on our gradually growing food as to prevent it from dying. We measure how much we feed it with what as to produce healthy crops and have the soil ready for other plants.